Natacha Nikokeza, Clementine Aulath, Dr. Sharon Morrison, and Dr. Holly Sienkiewicz (left to right) join hands before a Swahili salutation at the August Umoja gathering. Navigating the health care system isn’t easy. For Clementine Aulath, who immigrated to Greensboro from Central Africa three years ago, language and cultural barriers made health and financial decisions even harder. UNC Greensboro, UNC Chapel Hill and N.C. A&T State faculty are joining forces with Aulath and women like her in a community-engaged effort to ease these transitions. Aulath is president of Umoja Women’s Group. 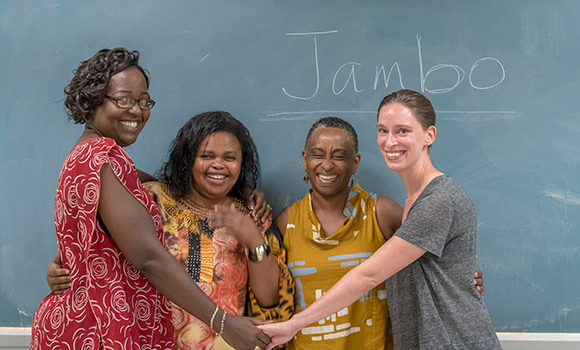 Umoja – “unity” in Swahili – was launched in 2014 when a refugee resettlement agency caseworker noticed an influx of Congolese women who were single mothers and reached out to the UNCG Center for New North Carolinians, or CNNC, for advice. “Our main purpose was to help women new to America adapt … so they don’t think they are alone,” Aulath explains in Swahili, interpreted by her son. Nonprofits help refugees learn English and job skills, but federal funding for that support ceases after 90 to 180 days. Refugees are expected to rapidly become self-sufficient. Umoja hopes to facilitate that process – with a particular focus on one of the most vulnerable populations, Congolese women. In 2016, the CNNC received Community Foundation of Greater Greensboro funding to implement an Umoja leadership and capacity-building initiative. The project includes plans for case management services, skill development workshops and social support – all facilitated by Congolese refugee women – and aims to prepare participants for employment and economic independence. The group of approximately 35 women meet once a month, eat together, listen to speakers, celebrate life accomplishments and provide social support. UNCG’s Dr. Sharon Morrison, associate professor of public health education, works with Dr. Rachel Boit (UNCG, human development and family studies), Dr. Maura Nsonwu (N.C. A&T, social work), and Dr. Beth Moracco (UNC-CH, health behavior) to assess the group’s unique needs and connect it with community resources. Want to learn more? Read the full story here. This post was adapted from a UNCG Research Magazine story written by Elizabeth L. Harrison. Photography is by Martin W. Kane.